Golf apparel can be both practical and comfortable, even in cold weather. Golfing year-round is every golfer's dream. Because traveling to warmer climates isn't always an option, consider adding cold weather accessories to your golf clothing choices. In cold weather, heat escapes from your head at a rapid rate. Covering your head will keep your body warmer through 18 holes of golf. Put away your standard Titleist, Ping or Taylor Made golf cap for the winter and pull out a stylish, warm alternative for golfing during the colder months of the year. Bowler hats or outback hats offer a warm alternative to your standard baseball-style golf cap. Imagine a traditional wool hat with a brim much smaller than a cowboy hat. These lined wool hats retain shape and are made of wool felt for durability. An added bonus is that many outback or bowler hats can be rolled or folded right into your golf bag. Crushing one of these hats makes no difference to the shape and condition of the hat. Just pop out the center and place it on your head. Water-repellent wool keeps your head warm and dry while golfing in the rougher weather of the winter months. Formed wool hats range in price from $30 to more than $100 for the higher-end brands. 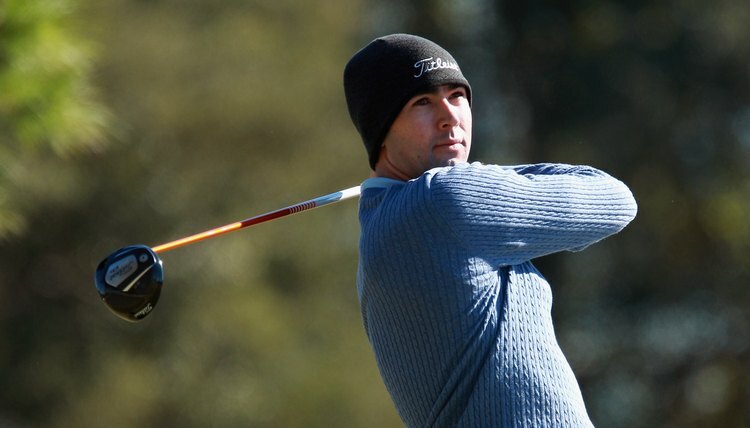 Beanies might sound slightly silly, but this describes your standard ski-hat-style golf hat. Beanies typically consist of acrylic fibers that resist water and provide warmth during the windiest days on the course. Some are fleece-lined while others are made of fleece for added warmth. Consider a standard ski stocking cap made of Merino wool for your winter golf outing. You don't need to buy specific winter golf hats to reap the benefits of being properly attired for a cold weather golf game. Beanies or stocking caps offer lightweight protection from the wind while providing breathable comfort without interference with your swing. Basic ski hats and beanies made of fleece cost about $20 and range higher if you choose to purchase combination fleece and acrylic hats. Simple knit caps suitable for cold weather begin at $10 and can be found at most sporting goods stores. Some players simply can't give up their favorite golf hat. If you fit this type, consider buying a foam-lined golf baseball cap. Foam-lined caps are considerably warmer than their thinner cotton cousins while still offering the typical cap look preferred by many golfers. Most caps offer water- and wind-proof protection and incorporate breathable material to maintain comfort. The foam insulation adds very little weight to these ball-cap style winter golf hats, making this a comfortable choice for staying warm. Because these caps don't keep your ears warm, consider adding a pair of earmuffs or a fleece headband. Both offer the option of added warmth in conjunction with any winter golf hat you choose. This style of golf cap costs about $20.